On the hunt for that perfect gift this holiday season for your eco-conscious loved ones? 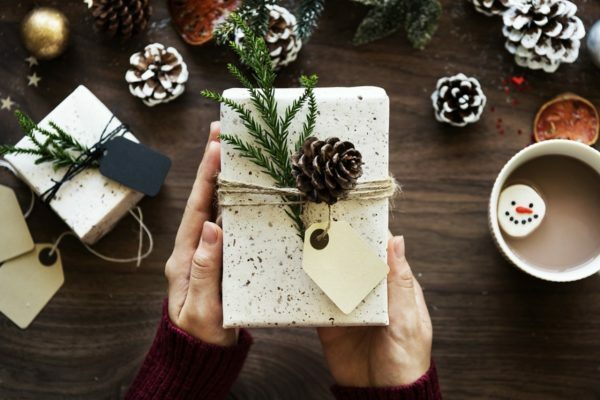 We have some eco-friendly holiday gift suggestions for everyone on your list. You can give the gift of protecting wild animals and habitat through the Sierra Club’s Adopt a Wild Animal — the recipient will receive an adorable plush animal. World Wildlife Fund also offers Symbolic Species Adoptions, with optional “adoption kit” for the recipient. Or, give the gift of trees through the National Forest Foundation and help restore National Forests. Alternatively, search for cruelty-free cosmetic or cleaning products on Cruelty-Free International or look for products with the Leaping Bunny cruelty-free label in the store. Find a gift made that reinforces your appreciation of a friend’s recycling, such as these notebooks crafted from 100 percent post-consumer recycled paper. Or search Uncommon Goods, a Certified B Corporation with a focus on sustainability, where you can find items like beautiful stemless wine glasses made from recycled glass and this upcycled cotton sari robe. Through its Better to Give program, Uncommon Goods donates $1 to a nonprofit organization with every purchase you make. Environmentally aware fashion labels are becoming more commonplace as awareness grows about the negative environmental and social implications of fast fashion. Check out this list of 35 fair trade and ethical clothing brands from The Good Trade that includes leading sustainable fashion brands like People Tree and Eileen Fisher. DIY Natural has endless inspiration for making natural gifts at home, like this how-to on making soap. Or peruse this handy list of handmade green gift ideas from Totally Green Crafts. Finally, get inspired by our own collection of DIY ideas. Host a craft party with your friends and bust out that stack of old magazines and art supplies to make silly collages. After all, who can say no to a thoughtful, handmade gift?